SmartGames has a new series of games that were specially made for those that like to have some fun while travelling. 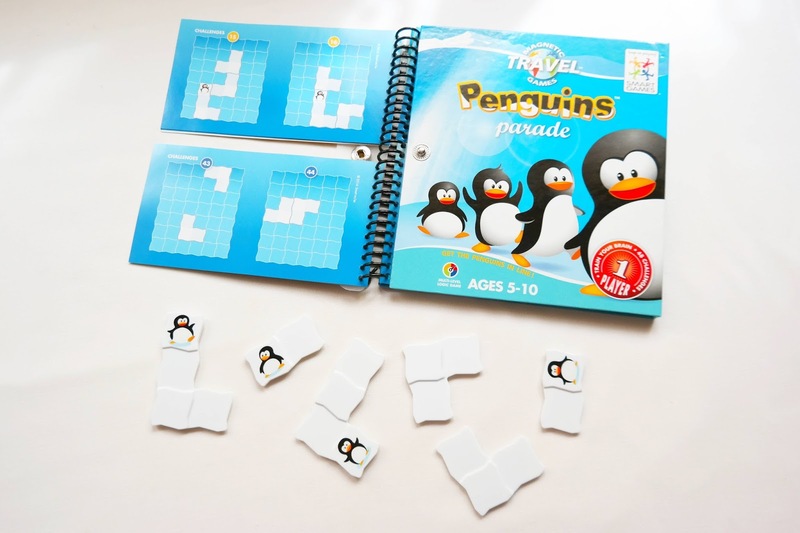 This Magnetic Travel Games series consists of several games in the form of a small notebook that closes with a clasp and has a magnetic board and pieces, so they don't get lost. It's a very convenient way to bring your favorite games along with you and to brighten your trips. 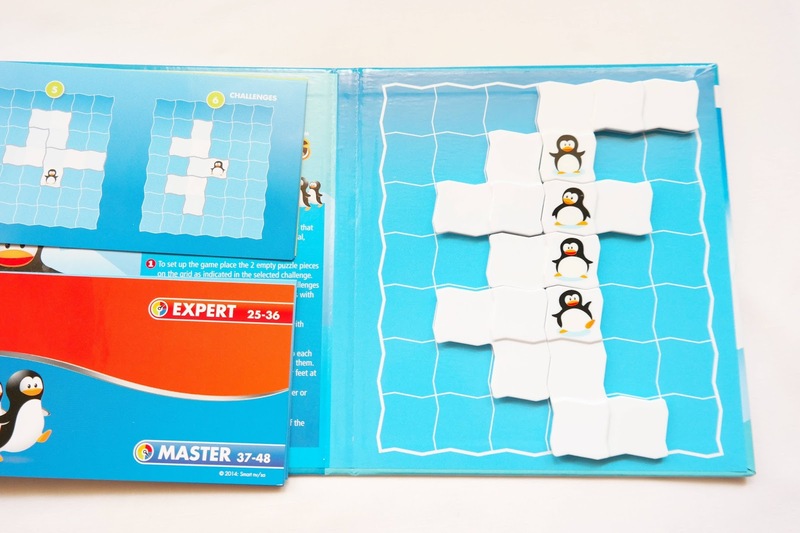 Based on the hugely popular game Penguins on Ice, Penguins Parade by Raf Peeters also has a unique concept for a packing puzzle and, despite being smaller, it's certainly not inferior, in terms of fun, than its predecessor. What you get is 48 challenges in four difficulty levels that promise to put your skills to the test. The game is classified for ages between 5 and 10, but make no mistake, some of these challenges can puzzle the most clever adults. I know I got my share of puzzling. The game consists of just six pieces of different shapes (their edges resemble broken ice) and the goal, unlike you may think, is not to fill the game board - it's a little more complicated than that. Four of the pieces have a penguin on them, placed in a different spot. 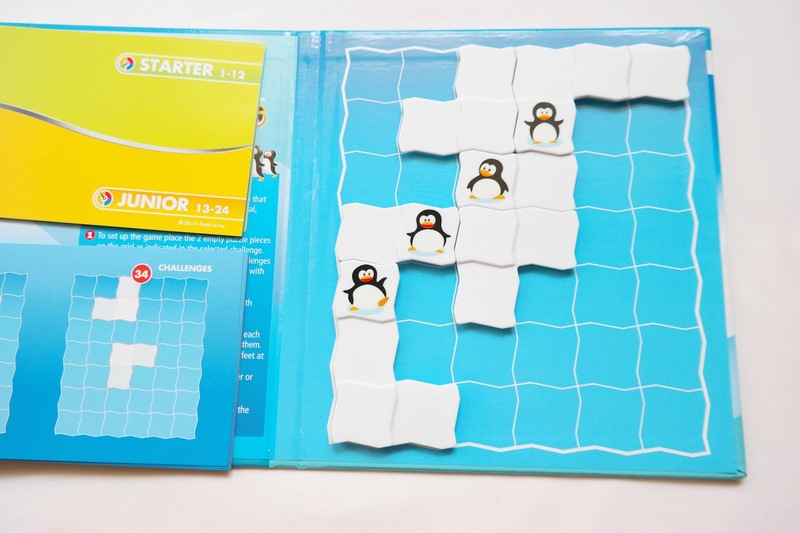 The pieces have to be placed on the game board so that the penguins form a straight line (horizontal, vertical or diagonal) and they all are facing you in the same direction. In other words, you can't have a penguin facing sideways or upside down. 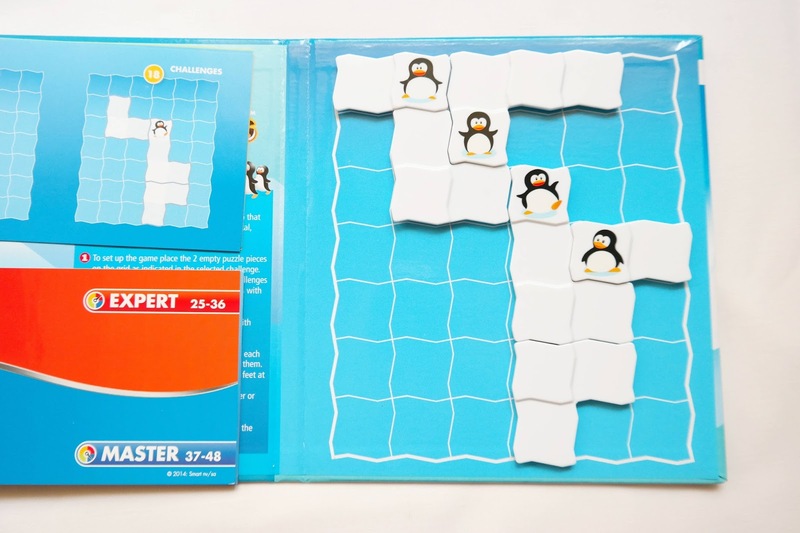 Also, no pieces shall overlap, but you can leave "icebergs" on the board (isolated pieces). Only the penguin pieces need to be connected without any empty spaces in between them. The challenges start out very easy and simple. 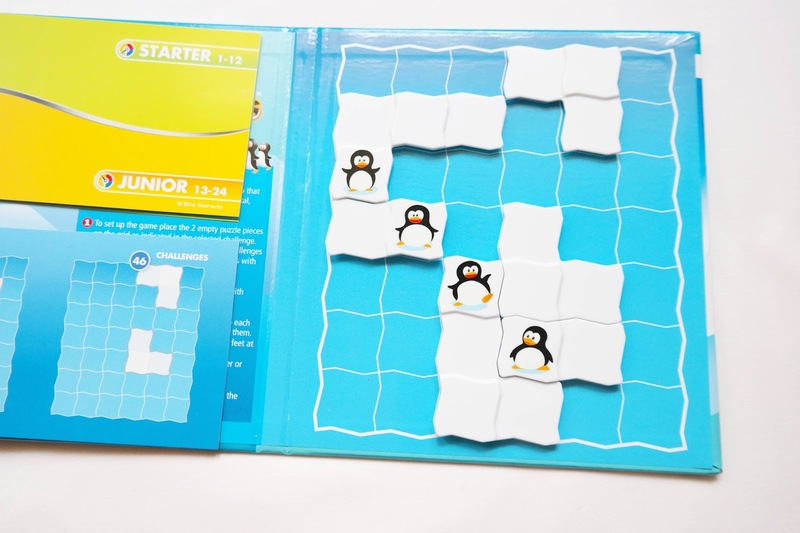 At first you can see two penguins already in place and two blank pieces, but slowly, as you progress, you'll see only the two blank pieces in the board, and you have to figure out where the penguin pieces go. I did find it a bit easier than other previous games, but I believe that any puzzle fan will find it challenging enough, or at least make your trip much more interesting. It's a real pleasure to play this type of games. Whether you play them occasionally, to kill the boredom, or you're just addicted to them, like me, you'll always find something to challenge your mind and to help you relieve the stress of daily life. You can try to get other games of the Magnetic series, so you always have a variety of choice whenever you have to travel. Availability: You can find any game from SmartGames at your usual puzzle places, from Amazon to PuzzleMaster. 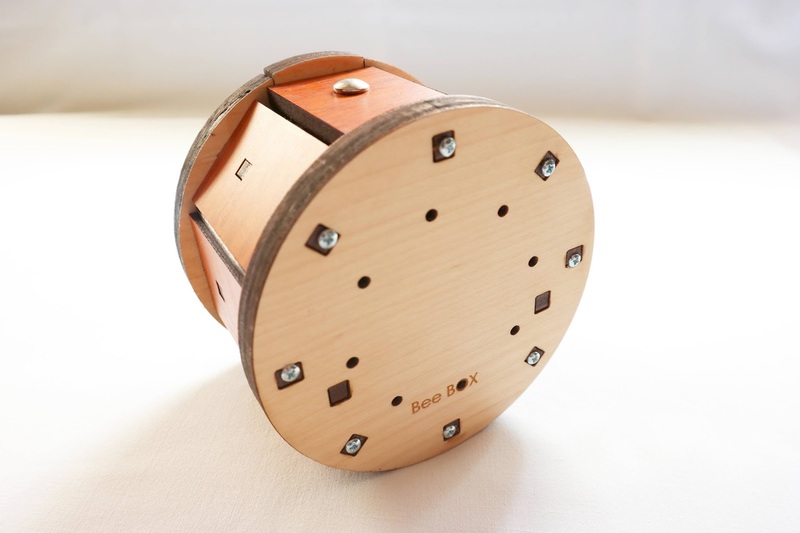 The Bee Box is essentially a trick box, which features a hidden mechanism that one needs to figure out before being able to open. 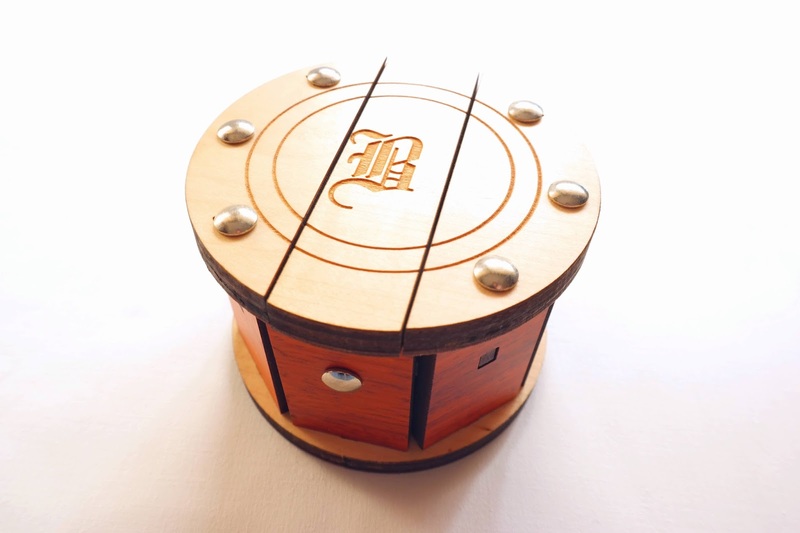 This box is beautifully made from two contrasting types of laser-cut wood in the shape of a beehive. While laser-cut wood is far from being a quality material, it actually keeps the price down without losing too much in the visual and presentation department. So far so good... But the positive aspects stop here. What I love about puzzle boxes is the fact that I get to discover their secrets, how their mechanism works. Well, this one is nothing like that. As soon as I picked it up to inspect it, it opened right in front of me almost by itself and presented itself to me with a handful of balloons. At first, I thought the mechanism or some other part of the puzzle was broken. How can this be? Is that all there is? Is there anything I'm missing? Indeed, there was, but not what I was expecting. Turns out, after some investigating, this is a puzzle you prepare for others to solve, not for you to enjoy. The goal is to fill one of the included balloons with air or water - yes, water is suggested, which is a great idea if you want to preserve your wooden puzzles - and put it inside the box so it will engage the lock and prevent it from being open. 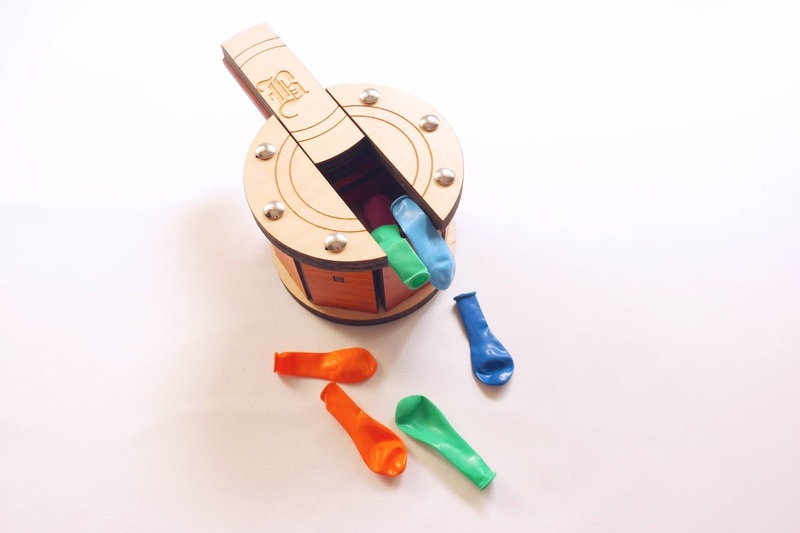 Now, the other person has to find a toothpick that's hidden in the outer casing of the box and puncture the balloon through one of the holes in the bottom and release the pin that's securing the lid. That's it. For me, puzzles are something I enjoy doing on my own. Because of this, I didn't find anything to like about Constantin's Bee Box but the fact that I collect puzzles and this one looks nice. It's a shame the puzzle's description doesn't mention any of this, otherwise I wouldn't have got it. Nevertheless, the idea is clever and if you like to present your friends with challenging puzzles, this may be a good choice. If you're like me, though, and you prefer your puzzles to be a challenge for you and not others, then you should skip this one. Sorry, Jean Claude. Availability: You can get a copy of the Bee Box at Brilliant Puzzles for $34.95 USD. If you like Jean Claude Constantin's puzzles, you can find more here.